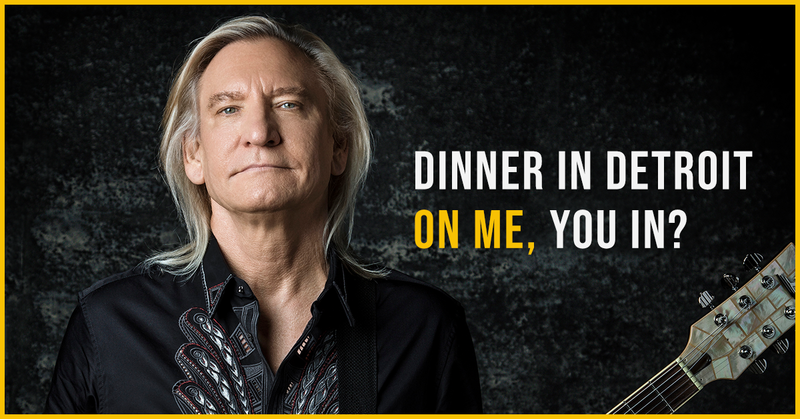 Join Joe Walsh in helping those who are battling addiction by donating $10 to Facing Addiction with NCADD. By donating, you’ll be entered to win a trip to Detroit for an amazing weekend experience exploring the city! You'll have an amazing dinner cooked by fantastic James Beard Award-nominated chef, James Rigato at his restaurant The Root. You’ll visit Glenn Frey Drive, the Motown Museum, and Jack White’s Third Man Records store. You’ll also visit the Shinola watch store and weigh in on a Detroit staple by sampling rival “coney” hot dogs at American Coney Island and Lafayette Coney Island. Cap off the weekend with a dinner with Joe before heading to the Eagles concert on Sunday night with two VIP tickets to see the show in style! Learn more here.